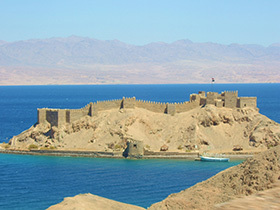 Although the site contains remnants of Byzantine-era buildings, Crusaders are believed to have built the original fort on this island in the Gulf of Aqaba in the early twelfth century during the reign of Baldwin I, King of Jerusalem, to aid in their control of one of the major routes between Cairo and Damascus. The Arab general and Islamic dynasty founder Saladin conquered the island and surrounding area in 1170-1171. Saladin ordered the Crusader fort to be consolidated and redeveloped. For about 150 years, it served an important strategic and symbolic role, until the nearby Crusades ended and the Mamluk governor of Aqaba moved his residence to the city on the shore. From the top of the citadel today, it is possible to see the countries of Egypt, Jordan, Israel, and Saudi Arabia.